Background: Traumatic head injury is a common cause of mortality and acquired disability in infants and children. However, patterns and outcome of head injury in infants are different from other age groups. Aims and Objectives: Aim of our study was to find out epidemiological factors, characteristics of injury, and outcome in infants with traumatic brain injury. Materials and Methods: This is a retrospective study from March 2009 through Feb 2012, at JPNATC, AIIMS, New Delhi. The clinical records of all patients, admitted with head injury were evaluated. Twenty-nine infants with traumatic brain injury were followed up and outcome was analyzed. Results: Twenty-nine infants with traumatic brain injury were included in the study. Of these 17 (59%) were boys and 12 (41%) were girls. Fall from height was recorded in 27 (93%) patients and road traffic accident was the mode of injury in 2 (7%). 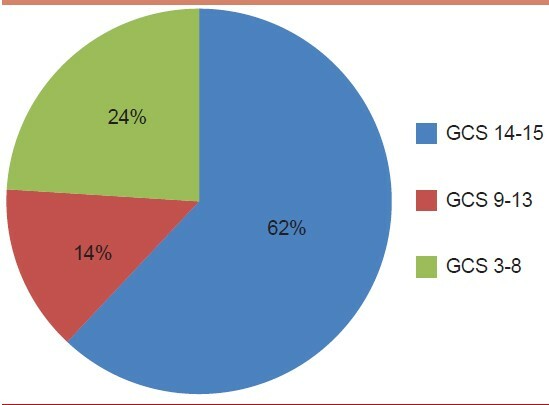 Mild head injury (GCS 14-15) was found in 18 (62%) patients, moderate in 4 (14%) patients (GCS 9-13), severe (GCS 3-8) in 7 (24%) patients. 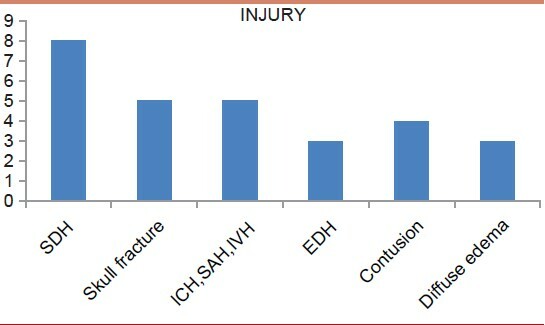 SDH was the most common injury in 8 (27%) patients. Out of these 4 (14%) were immediately operated, 25 (86%) were managed conservatively. Overall mortality was 11% (3 patients). Glasgow Outcome Scale was 5 in 20 (69%) patients and 3 (10.3%) patients each had GOS 3 or 4. Conclusion: Infants suffered significant brain injury due to fall. Traumatic brain injury in infants generally carries good outcome. Severe head injury was observed to be a predictor of poor outcome. Traumatic brain injury (TBI) is one of the leading causes of acquired disability and death, in infants and children. Falls and motor vehicle collisions are common non-inflicted causes, whereas child abuse in infants and young children are unfortunate inflicted causes of traumatic brain injury. A total of 10-35% mortality in pediatric age group has been reported in various groups. , Management focuses on limiting the progression of the primary brain injury and minimizing secondary brain injury. In this study, we attempted to analyze epidemiological factors, management, and outcome of TBI in infants. In this retrospective study over 3 years (March 2009 to Feb 2012), carried out at JPNATC, AIIMS, clinical records of all patients admitted with head injury were evaluated. Infants with traumatic brain injury were included in this study. These patient data including epidemiological factors, mode of injury, clinical findings, radiological findings, and interventions were analyzed and outcome assessed using GOS at the time of discharge from hospital and at follow up in outpatient department. Patients with absent brainstem reflexes and spontaneous respiration at the time of admission were excluded from the study. During the period of 1 st March 2009 to 29 th February 2012, there were a total of 29 infants admitted in neurosurgery ICU with traumatic brain injury in Jai Prakash Narayan Apex Trauma Centre, AIIMS, New Delhi. Age group ranges from 1 month to 12 months with mean age 8.7 months. Male patients were 17 (59%) and females 12 (41%). Fall from height was the mode of injury in 27 (93%) infants and RTA (Road Traffic Accident) in 2 (7%) infants. Presenting symptoms were loss of consciousness in 9 (31%) patients, vomiting in 5 (17%) patients, seizure in 4 (14%), ENT bleed in 3 (10%). A total of 4 (14%) patients were asymptomatic and rest presented with combination of more than 1 symptoms. Anterior fontanelle were tense in three patients. Pupils were dilated and nonreactive in 3 (10%) patients. Out of these patients 18 (62%) had minor head injury (GCS 14-15), 4 (14%) had moderate head injury (GCS 9-13) and 7 (24%) had severe head injury (GCS 3-8) [Table 1]. SDH (subdural hematoma) was observed in 8 (27%), skull bone fracture in 5 (17%), EDH (epidural hematoma) in 3 (10%), sub arachnoid hemorrhage (SAH), IVH, ICH in 5 (17%), diffuse brain edema in 3 (10%), contusion in 4 (14%)[Table 2]. Four patients from this group had multiple brain injuries including EDH, contusions, SAH, SDH, and skull bone fracture. Out of these, one patient had associated long bone fracture. ICP monitoring was carried out only in 2 (7%) patients. Out of 29 patients, 4 (14%) were immediately operated, 25 (86%) were managed conservatively, and 2 patients underwent decompressive craniectomy. In one patient EDH evacuation was done [Figure 1]a and b. Posterior fossa decompression was performed in one patient. A total of 3 (10%) patients were tracheotomised later due to prolonged ventilation. Out of these 4 operated patients, 3 (75%) patients were improved after surgery. 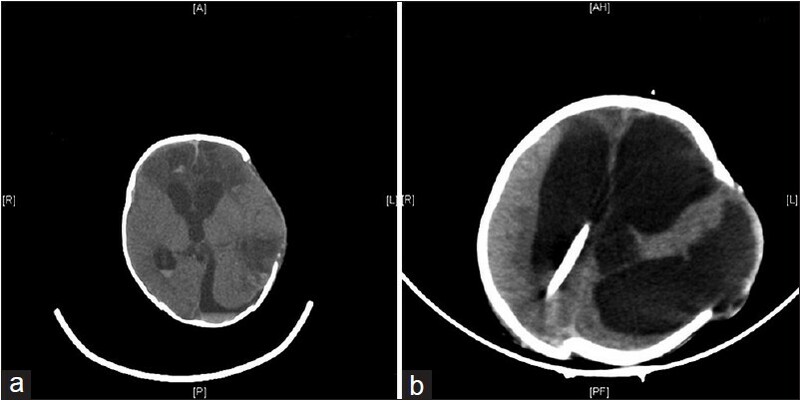 A patient who had undergone decompressive craniectomy presented after 1 month from discharge with post-traumatic hydrocephalus, and CSF diversion was carried out using low pressure ventriculo-peritoneal shunt [Figure 2]a and b. Patients were regularly followed up at outpatient department for a period of 6 months to 2 years (mean-10 months). Using GOS, outcomes was classified as good recovery -5, moderate disability -4, severe disability -3, persistent vegetative state -2, and death-1. Final Glasgow Outcome Scale was GOS 5 in 20 (69%), GOS 4, and 3 in 3 (10.3%) patients each [Table 3]. Hospital stay ranged from 1-27 days, with a mean stay of 5.7 days. Overall in hospital mortality was 10.4% in these patients. Three patients expired, and their intracranial pathology was SDH, ICH and diffuse brain edema in one patient each. Out of those who died, two patients were managed conservatively and one patient was operated - decompressive craniectomy done. A total of 2 (36%) patients out of 7 with severe head injury and 1 (25%) out of 4 patients with moderate head injury expired. In present study, incidence of traumatic brain injury in boys was higher than girls. The higher incidence of traumatic lesions in boys might, therefore, suggest that boys are at higher risk, perhaps because of their larger head circumference, more muscular and physical activities. , Most a common mode of injury was fall from a height, as described in a study by Wickham and Abrahamson  and Duhaime et al., followed by road traffic accidents, in some studies accidents were a common mode of injury. ,,, It has also been shown that the head injuries in infants are frequently the result of failure to protect the child from his/her environment or of failure of a protective device. Infants can also get injury by pulling household articles like chair, TV, and washing machine etc., Inflicted injuries were also a relative common mode of injury in few studies ranging from 19-33%. ,, However, in our study there was not even a single case of inflicted injury. Vinchon et al. reported a study including 150 children with age less than 24 months. Their study reported GOS 5 in 85%, GOS 4, 3, 2 in 3.33% patients each. Mortality was reported only in 5% patients. In another study by Hymel et al. in 54 infants showed, 4% mortality with a good outcome in 86% patients. In a report by Miyake et al.,  the outcomes in infants with both accidental and non-accidental trauma were compared. Most of the children underwent craniotomy for evacuation of SDH. In the non-inflicted group, 67% patients became normal, 11% had mild neurological deficit. A total of 11% had severe neurological deficit, and 1 patient died. Study from Chiaretti et al.,  in 40 children with severe head injury showed, GOS 4,5 in 52.3%, GOS 3 in 27.5%, and GOS 2 in 2.5% with a mortality of 17.5%. Present study shows good outcome (GOS 4, 5) in 80% of patients, severe disability, and mortality in 10% each. Post-traumatic hydrocephalus in infants is a common entity, more frequent in those patients who had a decompressive craniectomy. It was noticed in 1 of 2 patients who underwent decompressive craniectomy in our study. Our study confirmed the findings, reported by Duhaime et al.,  in accidental blunt head injuries, in children younger than 2 years of age, except for those caused by motor vehicle accidents and falls from a greater height. Infants suffer significant brain injury due to fall and accidents. Traumatic brain injury in infants generally carries a good outcome. Severe head injury was noted to be a predictor of poor outcome. Most of these injuries are preventable by ensuring proper vigilance and extra care by the parents and the caretaker. Timely investigation to establish intracranial pathology and early surgical intervention can lead to a good outcome. 1. Parslow RC, Morris KP, Tasker RC, Forsyth RJ, Hawley CA. UK peadiatric traumatic brain injury study steering group, epidemiology of traumatic brain injury in children receiving intensive care in the UK. Arch Dis Child 2005;90:1182-7. 2. Ewing-Cobbs L, Prasad M, Kramer L, Louis PT, Baumgartner J, Fletcher JM, et al. Acute neuroradiologic findings in young children with inflicted or noninflicted traumatic brain injury. Childs Nerv Syst 2000;16:25-33. 3. Adelson PD, Kochanek PM. Head injury in children. J Child Neurol 1998;13:2-15. 4. Glasgow JF, McGovern SJ. Initial management of the multiply injured child: Structured approach reduces morbidity and mortality. Curr Pediatr 1997;7:187-92. 5. Jennett B, Bond M. Assessment of outcome after severe brain damage. A practical scale. Lancet 1975;1:480-4. 6. Feickert HJ, Drommer S, Heyer R. Severe head injury in children: Impact of risk factors on outcome. J Trauma 1999;47:33-8. 7. Jones PA, Andrews PJ, Easton VJ, Minns RA. Traumatic brain injury in childhood: Intensive care times series data and outcome. Br J Neurosurg 2003;17:29-39. 8. Levin HS, Mendelsohn D, Lilly MA, Yeakley J, Song J, Scheibel RS, et al. Magnetic resonance imaging in relation to functional outcome of pediatric closed head injury: A test of the Ommaya-Genarelli model. Neurosurgery 1997;40:432-40. 9. Vinchon M, Defoort-Dhellemmes S, Desurmont M, Dhellemmes P. Accidental and nonaccidental head injuries in infants: A prospective study. J Neurosurg 2005;102:380-4. 10. Wickham T, Abrahamson E. Head injuries in infants: The risks of bouncy chairs and car seats. Arch Dis Child 2002;86:168-9. 11. Duhaime AC, Alario AJ, Lewander WJ, Schut L, Sutton LN, Seidl TS, et al. : Head injury in very young children: Mechanisms, injury types, and ophthalmologic findings in 100 hospitalized patients younger than 2 years of age. Pediatrics 1992;90:179-85. 12. Chiaretti A, De Benedictis R, Della Corte F, Piastra M, Viola L, Polidori G, et al. The impact of initial management on the outcome of children with severe head injury. Child's Nerv Syst 2002;18:54-60. 13. Pineda JA, Leonard JR, Mazotas IG, Noetzel M, Limbrick DD, Keller MS, et al. Effect of implementation of a paediatric neurocritical care programme on outcomes after severe traumatic brain injury: A retrospective cohort study. Lancet Neurol 2013;12:45-52. 14. Keenan HT, Runyan DK, Marshall SW, Nocera MA, Merten DF, Sinal SH. A population-based study of inflicted traumatic brain injury in young children. JAMA 2003;290:621-6. 15. Jayawant S, Rawlinson A, Gibbons F, Price J, Schulte J, Sharples P, et al. Subdural haemorrhages in infants: Population based study. BMJ 1998;317:1558-61. 16. Barlow KM, Minns RA. Annual incidence of shaken impact syndrome in young children. Lancet 2000;356:1571-2. 17. Myhre MC, Grøgaard JB, Dyb GA, Sandvik L, Nordhov M. Traumatic head injury in infants and toddlers. Acta Paediatr 2007;96:1159-63. 18. Hymel KP, Stoiko MA, Herman BE, Combs A, Harper NS, Lowen D, et al. Head injury depth as an indicator of causes and mechanisms. Pediatric 2010;125:712-20. 19. 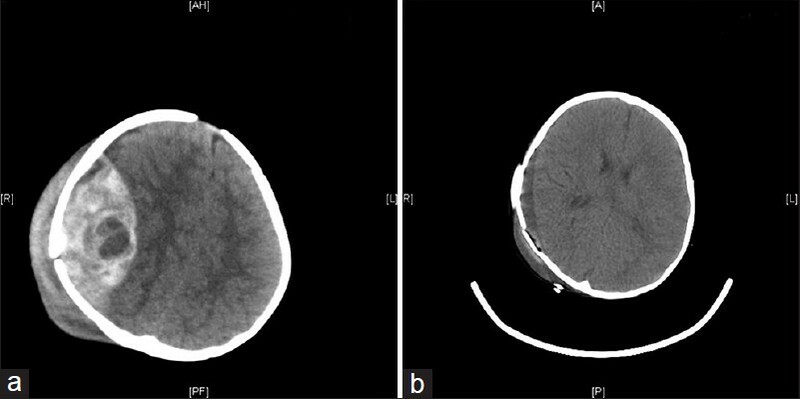 Meservy CJ, Towbin R, McLaurin RL, Myers PA, Ball W. Radiographic characteristics of skull fractures resulting from child abuse. AJR Am J Roentgenol 1987;149:173-5. 20. Vance BM. Ruptures of surface blood vessels on cerebral hemispheres as a cause of subdural hemorrhage. AMA Arch Surg 1950;61:992-1006. 21. Gennarelli TA, Thibault LE. Biomechanics of head injury. In: Wilkins RH, Rengachary SS, editors. Neurosurgery. 1 st ed. New York: McGraw Hilb; 1985. p. 1531-36. 22. Stalhanimer D. Experimental models of head injury. Acta Neurochir Suppl (Wien) 1986;36:33-46. 23. Hymel KP, Makoroff KL, Laskey AL, Conaway MR, Blackman JA. Mechanisms, clinical presentations, injuries, and outcomes from inflicted versus noninflicted head trauma uring infancy: Results of a prospective, multicentered, comparative study. Pediatrics 2007;119:922-9. 24. Miyake H, Kajimoto Y, Ohta T, Kuroiwa T. Managing subdural fluid collection in infants. Childs Nerv Syst 2002;18:500-4. 25. Adamo MA, Drazin D, Waldman JB. Decompressive craniectomy and postoperative complication management in infants and toddlers with severe traumatic brain injuries. J Neurosurg Pediatr 2009;3:334-9.